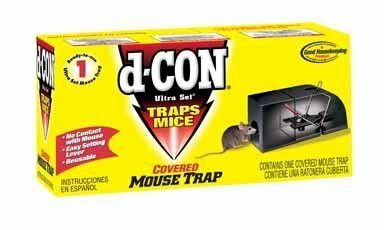 The D-Con is the ultimate “no touch” kill trap, for those too squeamish to handle dead mice. If you must use a kill option, but the idea of seeing, and handling a dead rodent horrifies you, the D-Con is a great product to check out. The internal mechanism this mousetrap utilizes the same exact concept that the old Victor Ward and metal mousetrap innovated way back in 1898. The difference is the innovation of a housing unit, that the creditor must crawl into to get to the bait and subsequently meet the business end of the metal guillotine. Yes I know it is still very sad to think about, but if you have reached the point where you need to kill then this is a way to keep it out of sight and out of mind. The other hidden benefit of the small tunnel that the creature must enter, is that it is a lot harder to grab the bait and run which is often a problem with snap traps if they are not properly set up. When the mouse enters the small passageway they must also face forward into the head of the trap, which helps ensure that the snapping mechanism comes down right on the neck which is where the cleanest kills take place. If you have small pets, or pets of any size that matter, another key side benefit is that they will not be able to hurt themselves by triggering the trap. I mostly recommend peanut butter as a bait as that is what I’ve had the most success with. Unfortunately, most dogs, and some cats, love peanut butter just as much as mice do. While it is never happen to me, I have heard horror stories of some pet owners having to deal with an injured loved one shortly after setting the trap. There is a huge catch with the d-con mousetrap, and that it is very difficult for a newbie to properly set. Unlike some of the uncovered and newer model snap traps which use a simple lever press to automatically set the trap, this device has an intricate mechanism inside of the killing chamber itself which many people have reported problems with. The spring will often snap itself when you are trying to set it up for the first time. Luckily, unless you stick your fingers deep inside the hole you will most likely not be hurt, but it is extremely annoying and some people report giving up after spending an hour or more unsuccessfully trying to set their first trap. This is also not a reusable style of mechanism, so even though the price is not astronomically high for your first purchase, it can add up over time. Our top pick for till traps currently, the JT Eaton , can be reused multiple times except in the rare of that that it breaks. This is not the case here, so keep in mind that this is the price you’re paying for a hands off disposable one-time use trap.